Good VPN Service with a reliable but very basic VPN client. How fast is the VPN Service Switch VPN? SwitchVPN has been operating since 2010 and has servers based in 17 different countries. The company offers a number of price plans, ranging from the budget Lite package to a complete plan for businesses with ten connections. One positive aspect of SwitchVPN is the 24/7 customer support service. The SwitchVPN support team is available 365 days a year and the useful instant chat facility makes it easy to get advice quickly. Users benefit from unlimited bandwidth with quick, unlimited downloads and have the ability to switch servers as many times as required. One useful feature of the service is the ability to unblock sites with geographical or website restrictions anywhere in the world. Included protocols are OpenVPN, L2TP, SSTP and PPTP. The service supports multiple operating systems like MACS, Windows or Linux and a variety of platforms including, desktop, laptop, iPad, mobile phones. 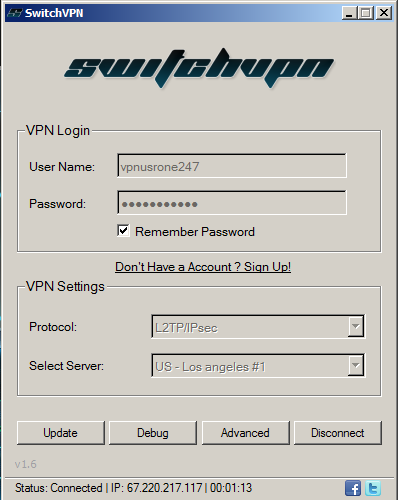 It’s free to set up SwitchVPN and an easy system to install, using the step by step instructions. The budget Lite package includes one connection, with a small charge for any add on connections. The ComboPro plan has a realistic price and offers two simultaneous connections. The more expensive business plan includes ten connections and all the plans offer compatibility on all devices. Watching American or UK TV channels is an easy matter with SwitchVPN, so there’s no problems accessing Hulu or Netflix from wherever you are in the world when you have this reliable VPN service. ISP restrictions from countries operating censorship like China and Dubai are bypassed when users log in via their SwitchVPN accounts. SwitchVPN software supports Windows XP, Windows 7 and 8, Vista, Mac OS X 10.5 or above and Linux and the site’s knowledgebase provides quick and easy access for troubleshooting any set up problems or finding out more. Users that do have problems with the service can use the remote assistance to troubleshoot using a downloadable program called Teamviewer. Contact with SwitchVPN is easy via email, Skype or through the instant chat window that opens as soon as a user logs into the site. Surfing the web with anonymity is guaranteed when using SwitchVPN, this is useful in so many ways and the 1024-2048-bit strong encryption protects the user from hackers and spies and secures all connections from any unwanted monitoring. SwitchVPN does not keep any traffic logs so users can be assured their details will never be passed on to any third parties at any time.